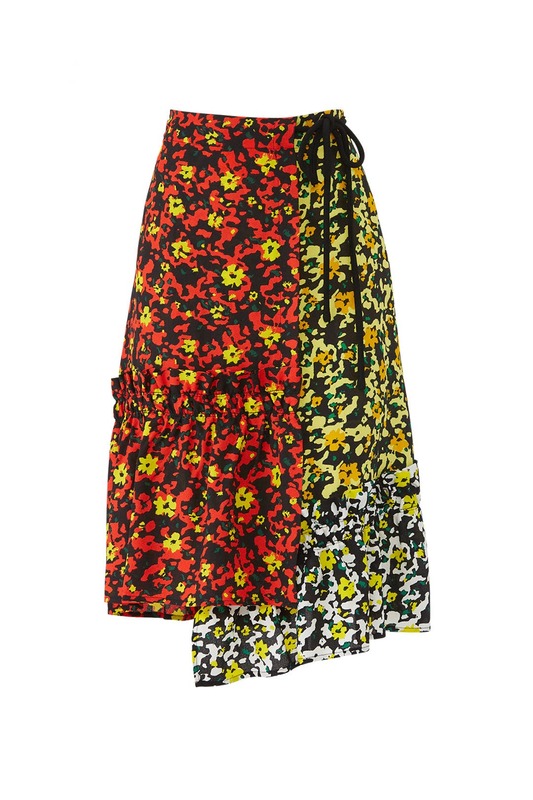 Colorblocked floral printed midi skirt from Proenza Schouler will catch everyone's eye. Style with the Ginestra Metropolis S Tote by Furla and the White Black Striped Shirt by Christian Pellizzari. 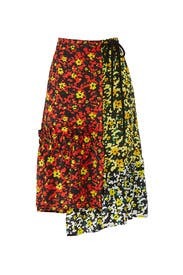 Red and yellow floral printed georgette (100% Viscose). Skirt. Hidden side zipper with hook-and-eye closure. 27" from waist to hemline. Imported. Gorgeous pattern, weight, length and so versatile! This skirt is GORGEOUS. With a chunky sweater, tights, and boots, it can be worn for work or for play. The details - a tie on the left waist and ruching midway down the right leg - add sophistication and just a tiny bit of "trend." It sits a little below the waist on me, so I'd say it runs a tad large although not so much so. I'm also 6'0" and it is below the knee, so it'd be long on shorter gals. Being able to rent brands that would normally be out of my price range is the best! I rented this a size too big because I was shopping at the store and just had to have it! It has a tie at the waist, so it's adjustable if you accidentally go up a size. 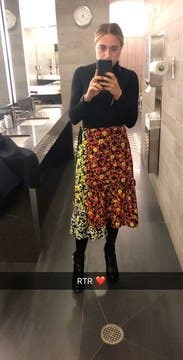 I love the pattern clashing on this skirt and wore it with some Doc Martins and a leather jacket to make it more casual for everyday. I would rent this again and again and again! 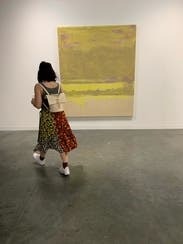 This is a great piece. It is fun and comfortable. I could have gone a size down and been comfortable. 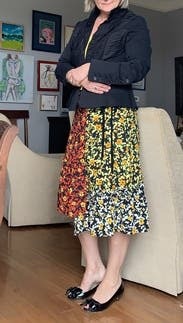 Wore to work once and to dinner party. Loads of compliments. Would buy for myself if not so expensive. Rented this for work and then wore it again to synagogue. Got tons of compliments. 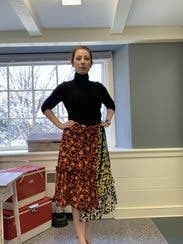 As other reviewers noted, it was a touch loose in the waist so that it lies a little low on the waist - that works even better for me because I am a straight, petite build so skirts on the waist can make me look wider. The print is so cool and funky. It was really fun to wear with black tights, suede heels and turtleneck. And very comfortable as well. 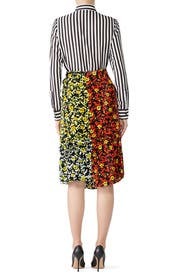 My only complaint is that it is not lined, which I find surprising for a skirt this expensive. But still I love being able to rent a super $$$$ designer piece. Loved this but it's long on me! 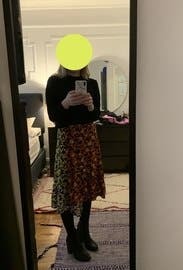 This skirt is so fun to wear (I posted a photo that sort of shows how the skirt moves). The colors aren't as extreme in real life, and the design is so eye-catching. And no static! Fits true to size. Absolutely beautiful and vibrant colors. Got a lot of compliments from men and women. Wore with a black sweater and boots but could be easily paired with a "louder" color or stripes! I loved wearing this skirt. The bright colors, ruffles, and asymmetric design was great. It fit really well. I wore a size 2 and I'm usually between a size 2 and 4. I would definitely rent this again. Love! Love! Love this outfit. I wore it just like the picture. 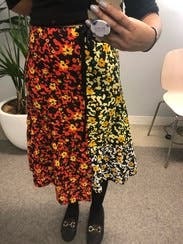 I saw it in an ad where they pair the top and the skirt together. The skirt fits TTS. There are no stretch in the fabric. I got so much compliments all night long. Fabric is thick enough for cold weather. I wore mine with some black leather booties. I was still able to rotate the pieces to wear with different tops or bottoms. Def will rent this piece again in the future. Dress is bright and easy to slip as the thick material keeps it's structure. No cons—it's fun, colorful, and versatile! 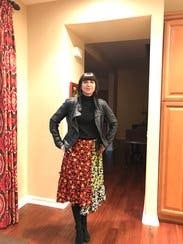 This skirt was so fun to wear & very well made. The fabric feels expensive and though I'm short, the length was perfect for me. The unique hem, bright colors made it easy to style, and it matched perfectly with my orange polka dot air force ones :) . I also wore it to work with a cropped black hoodie. I was very tempted to buy this skirt & will look to rent it again! I wore this to a work holiday party and loved it. It was super flattering and colorful enough. I absolutely loved this skirt. 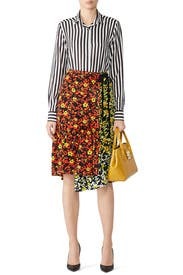 The bright colors in printed the skirt are so fabulous to spice up any basic black top. Totally can dress the skirt up or down and it is totally wearable for any season. Cute fun dress, great fit, great length, loved the two tone. But why is there a word ruffle at the mid length? I didn't notice it in the pictures, if so would not have ordered. Will rent again for sure. The only con was a little big on waist but I used the side tie to adjust it. That worked fine except a few times the tie would come undone. Just tie tighter! Like most PS pieces on RTR, this one is a knockout. The fabric and cut are amazing and flattering. I am a 4/6 and the 4 was perfect. PS tends to run a little big. The print is awesome. Very different. I paired with a black turtleneck and boots. LOVE this one. The high quality fabric and attention to details made this skirt a surprising staple. It was so easy to dress up or down. I would buy it if it weren't so expensive. Such a beautiful piece. Wore it with black shirt, lace-up boots, and a leather jacket. Can definitely dress up or down. Already thinking of how to wear it again with a sweater, and will definitely rent in warmer weather. Two compliments. Skirt sits lower than the waist, more on the hips. Could size down to wear higher up. I loved wearing this skirt. The mix of the patterns and flow of the skirt was beautiful. 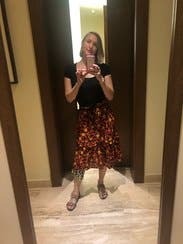 I received tons of compliments whenever I wore this skirt. I really loved the look and was looking forward to buying it but it was way too expensive for my taste. Especially knowing that the skirt doesn't have a liner. 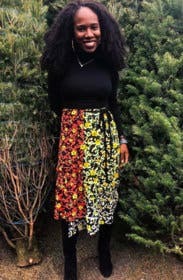 But if you're looking for an exciting print to add a punch to your wardrobe this skirt is for you! I rented one size smaller than my usual bc it was all that was available, thinking the wrap would allow for some extra room. But - the skirt actually zips on the side and is a faux wrap. Still super cute when paired with a black turtle neck but does wrinkle easily. 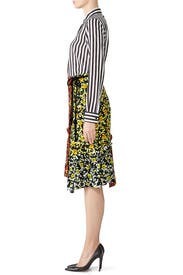 This skirt was super cute- great print and paired well with a number of blouses. Didn't want to send it back! Love, love, loved this skirt. The fit was fabulous (true to size, hit me mid-calf and I'm 5'8). Wore for date with tank / leather jacket and then for work with a black sweater. Super versatile. The ruffles and detailing are stunning. Gorgeous skirt, fits great (though slightly looser than expected in the waist). I wore this maybe 4 times? Never didn't get a compliment or two on it. It's so unique and pretty. Will definitely rent again. 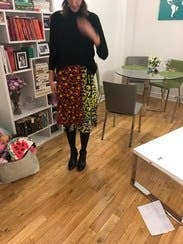 This skirt was perfect to bring in some color into my winter work wear. The material had a nice drape, but you do need to be cautious of the side slit - especially, getting in and out of cars and big wind gusts. The skirt waist band was slightly large and did not sit even on my waist. Overall, a great skirt for any season! Received lots of compliments. Pretty pattern. Very comfortable. Love the feminine feel of this skirt! I should have gone down a size. If you're like me and have smaller waist compared to your bum, then I would go down a size. I rented this for daily wear. 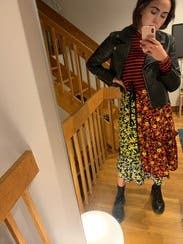 I loved the bright pattern and paired it with a black turtleneck and OTK boots. The skirt sits at your hips (it's not high waisted) and fell to below my knees. It was a little longer than I was expecting. The waist is nicely tailored and really flattering. Fabric is a light synthetic material that doesn't get static cling. It was almost too big to wear. I had to safety pin it and tie it tight. And I have not lost any weight recently so it wasn't me. 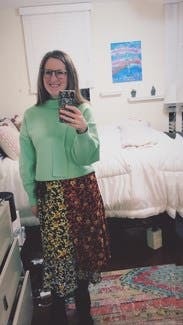 Love the fit and fabric of this skirt! I paired it with a black crewneck sweater, black tights and black high boots for a chilly spring day. Can easily see it transitioning into summer with a different top and shoes. The faux wrap makes it really easy to wear but very visually interesting. Would buy this in a heartbeat if it was within my budget! 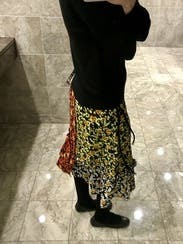 I love the fun multi patterned skirt, it was so flattering and memorable. A showstopper in all the right ways. Absolutely renting again, great spring piece! 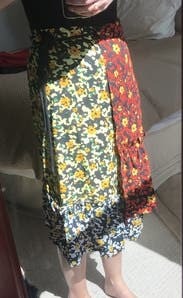 Chic skirt with a modern floral print! 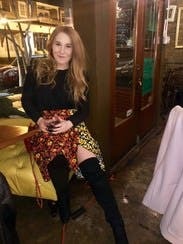 Loved wearing this skirt! 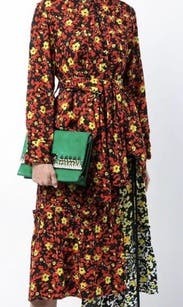 Great print and shape that's perfect for late winter / early spring. Wore this numerous times in very different ways. It was not the most figure flattering, but adding a slim jacket helped w proportions. The fabric is a poly-crepe. Underwhelming hand, but still enjoyed the rental. I am usually around an 8 and this was a bit big. With the tie at the waist I was able to tie it so it sat at my waist. I received a lot of compliments. It was a little long on me but I wore heels with it so that helped. Good quality, has a weird little ruffle all the way around that I didn't like. Otherwise cute and versatile.